The Art of Looking Addlepated! 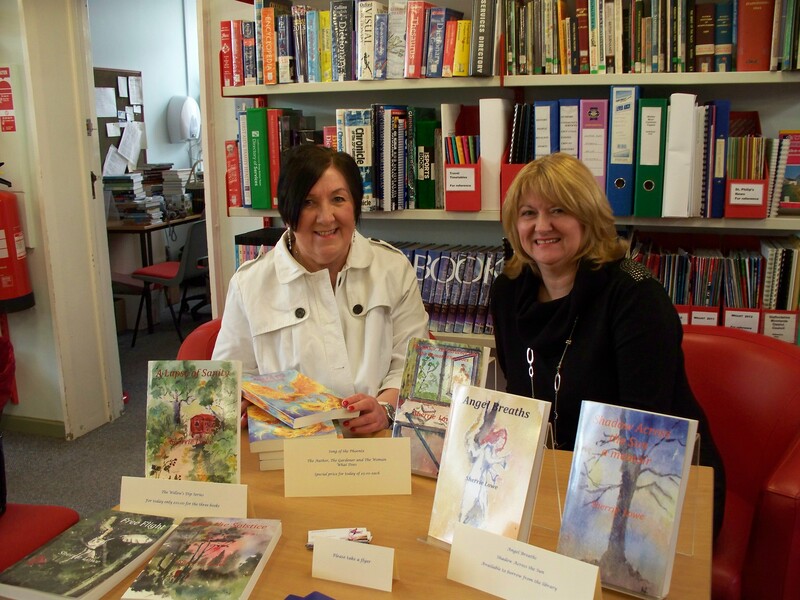 Anyone who’s looked at my website will know of my book event at Werrington library just before Easter. What you don’t know is what a dolt I made of myself in the name of being affable. Those of you who’ve read my blog post ‘Researching Free Flight’ will remember Dave, the man with the birds who was instrumental to the story, well as time passed I found him on Facebook; the only time I’ve seen him without a hat is on his profile picture. Imagine the scene then if you will; my friend and I, plus our other friend’s mum had just got ourselves comfy behind the table displaying my books as a gentleman resembling Dave – minus hat – walked up and hovered round the table. Remember I’d only ever seen Dave in the flesh wearing a wide brimmed hat so I wasn’t sure if it was him or not but if it was I didn’t want him to think, ‘Ignorant cow, I’ve helped her and she doesn’t even recognize me.’ My brain processed all of this at lightening speed – the only part of me that ever functions at lightening speed, and then only rarely – and before I could stop it my mouth had joined in. It was a long time since I’d been called a dolly bird – if ever as I cast my mind back – and I was dimly aware of my friend choking back laughter. She’s always been one who if she’s got to laugh she’s got to laugh and just then she was making a valiant effort to suppress it. The man clearly thought I was barking. Why in God’s name would he know Dave just because he bore a vague resemblance to him? My auntie had always said, as had many before her, ‘Better to keep your mouth shut and look a fool than to open it and remove all doubt.’ I’d certainly removed all doubt! I changed tack in an effort to seem more sane. “Do you read?” I asked with what I hoped was a more intelligent look. My friend almost came undone. I think I muttered an ‘Oh’ with a sickly grin and he took the seat in front of the computer beside our table. More people arrived then: my writing friend and his wife, a neighbour and her family and a class of delightful primary school children who were awestruck at meeting ‘a real author,’ to quote one young man. They all took one of my fliers with information about my books and queued up to get them signed; I felt like J.K.Rowling! I didn’t shatter their illusions by disclosing that I was a struggling indie and twelve of their mums visited my website that night, but I digress. The man who wasn’t Dave joined in our conversation as more people stopped by and he said that his wife was a reader and what did I recommend? To cut a long story short he decided he’d buy the Willow’s Dip series for her for Easter, which were on a 3 for 2 offer – well Morrison’s do it don’t they! He tootled off to the Co op round the corner to get some cash and I thought that was the last I’d see of him. He’d made good his escape from the raving looney author; he wouldn’t be back, but I was wrong. I went over to meet him at the reception desk to do the transaction and assure him that the books were signed and money exchanged hands. He was a little tactile, hand on the back sort of stuff and I’m not one for physical contact, don’t really like people in my personal space, but well, he had bought the books hadn’t he. Perhaps he didn’t think I was completely bonkers after all and he came back to our table with me. I felt the need to explain my earlier mistake. “I’m sorry I mistook you for someone else,” I told him. If I’d have left it there it would have been fine, but oh no, I couldn’t resist, just had to have one more go. “Do you know Dave?” I repeated. If he still had any doubts regarding my sanity that must have convinced him that I was totally and utterly addlepated! I wonder if his wife enjoyed the books? The best post on your blog site yet. Only someone who regularly puts ones foot in it can empathise with your predicament. Why when you know you’ve made a blunder do you add to your discomfort by attempting to extricate yourself only to make matters worse. Your description of the episode is hilarious…thank you for the laugh. I just wonder if the poor man has recovered yet. Thanks Maureen, glad it gave you a laugh! Just in case anyone notices I’ve liked my own post and thinks how pretentious, I was only testing to see what happened!?! Such a comfort to know I am not the only one who does such things. A comfort to me to to know I’m not alone! That’s funny. I hope the book event was successful. My name is Dave by the way. Ah, another Dave to confuse me!! The book event went well thanks.